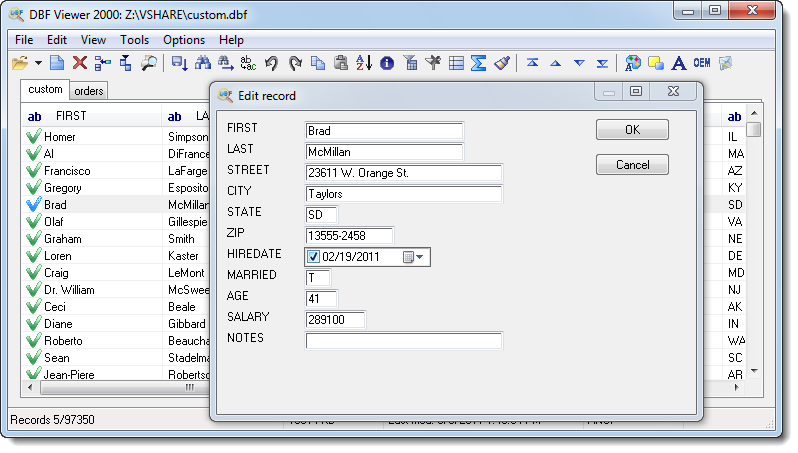 DBF Viewer 2000 allows you view, modify, sort, query by example, remove dupes, send DBF files to print and export to other formats, including TXT, CSV, Excel (XLS), HTML, XML, PRG, SQL. Using DBF Viewer 2000, you can view and modify memo fields in dBase III, dBase IV, FoxPro, Visual Foxpro and dBase Level 7 formats. To connect to databases, DBF Viewer 2000 does not require external driver. The program runs under Windows XP/Vista/2008 and Windows 7/8/10 (32/64-bit). Below is the list of all main features of the software. View, edit and export memo fields.